Franck and Simon are both good cops and partners. Simon has been troubled since he killed three in a drunk driving accident, but when Simons son witnesses a murder, and is hunted by ruthless killers, he's efficiently back. This is one of the few moments of my life where I could enjoy a movie without reading sub titles. This time it is not Russian, not Swedish, not Danish, not German and not Spanish. It is an art movie in my native Lebanese language. The lovely acting of all the team, the superb cinematography of Yves Sehnaoui and the charming music of Khaled Mouzanar all joined to make a movie to remember. This is a movie about woman's inner being; men are in the background and the women's disorders are all exposed in a very elegant way. Uncertainty of life, sexuality, marriage, mid life crisis and elderly all put together in a colorful plot of innocent people. 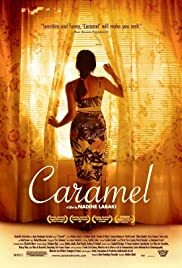 In Caramel, we also see Christian and Muslim women living together, working together, truly loving and supporing each other. Thanks to Nadine Labaki for this message during a period of secterian conflicts. The Last scene of the 2 ladies holding hands is a painting. I can't wait to get it on DVD. This will sit at the heart of my art movie collection.